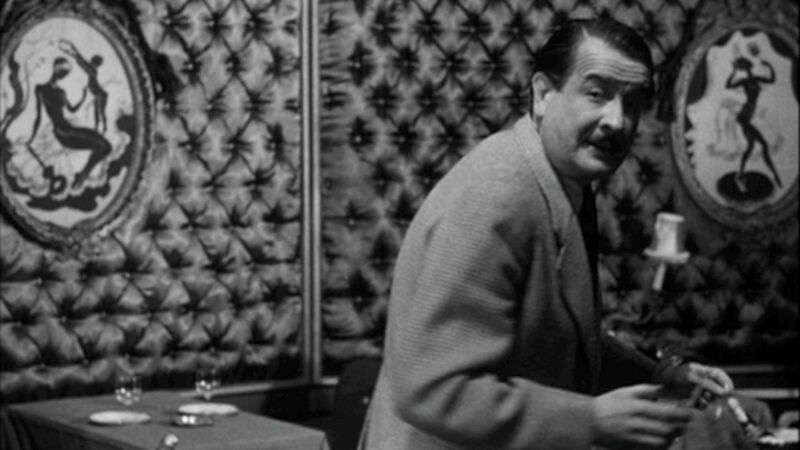 Today’s frame finds our elusive Romanian friend Popescu skulking away from the center of this frame as if afraid that the limelight might shine out the dark secrets hidden beneath his thick mustache. Maybe he fears being the center of attention but maybe a shadowy figure like Popescu simply fears the symmetry that his central presence would instigate. Were Popescu standing front and center, facing our camera-eye, the organized symmetry of this frame would be almost Wes Anderson–esque. The organization and evenness of that frame would leave no room to hide his secrets—not like the four-government bureaucracy that serves to muddle Vienna, a system convoluted enough to hide all of Popescu’s secrets. Popescu’s elusiveness, which Matt delved into last week, only serves to draw our interest away from him and toward the figures that populate the background of this scene. These figures are reminiscent of ancient Greek black figure pottery, popular in Corinth between the seventh and fifth centuries BCE. Yet the figures themselves are definitively modern-era. Specifically the figure on the right seems like she could be stepping out of a 1920’s nightclub. 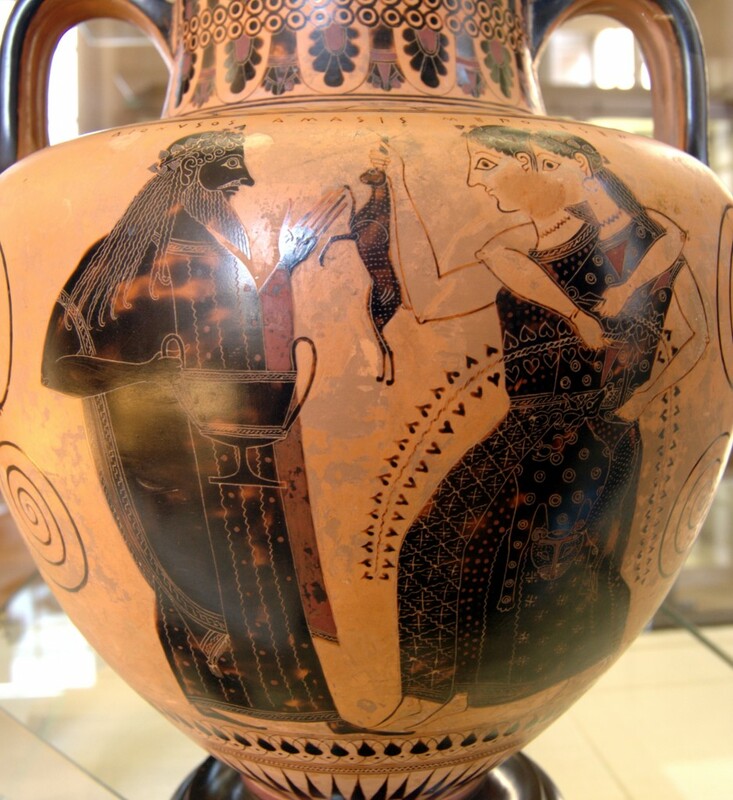 Unlike their predecessors in ancient Greek pottery, their imaging is reversed. Corinthian pots delineated male and female figures by color, in black figure pottery the male bodies were inscribed in black while the females were only given black outlines. But our female figures are more filled-in, and from their pose and positioning seem more empowered as well. While the Greek image below shows two female figures (Maenads) literally serving a male figure (Dionysus) by offering him a rabbit. Our figures, by contrast, sit independent in the middle of the frame and through their posturing, are offering rabbits to no one. Ancient Greek black figure pottery shared a strong likeness with the dark figures that populate the background of this frame. The Casanova club itself seems like a fitting place for a tribute to Dionysus (the god of wine and debauchery) but its walls are instead populated with these images of stark, individual, women. As Popescu stalks away from the frame, evading difficult questions, and Holly prepares to accidentally inform on Harry’s porter, these shadowy women serve as a reminder of the only truly courageous character: Anna Schmidt. As she continues helping Holly in his investigation, it becomes clearer and clearer that she was the only one of the bunch who truly loved Harry, and even though she is putting herself in more and more danger by doing so, she is devoted to finding out what really happened, for Harry’s sake. On a couple of occasions she has seemingly reminded Holly that his cowboy crusade should really be for Harry’s sake, rather than his own ego. But in the micro-scene that today’s frame circles–a conversation between Holly and Popescu–Anna has seemingly sunk into the shadowy background of the Casanova club. She is–or was when we last saw her–drinking alone at the bar while Holly “interrogates” Popescu. Perhaps these two silhouettes are meant to be her stand ins, winking at us from the edges of the frame and saying, “will you look at these idiots?” Whatever they are saying, though, their presence is muted as far as the plot or the characters themselves are concerned. They remain, like Anna Schmidt, a shadowy figure alone in the distance.